Da-Lite has introduced a new accessory for its lecterns that allows an instructor to deliver presentations directly from an iPod or iPhone. 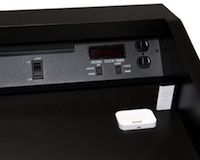 The new universal iPod dock accessory can be recessed into the reading surface of any Da-Lite lectern. The company cited the increase in software solutions that facilitate storing and delivering presentations directly from the iPod or iPhone as the reason for adding this capability to Da-Lite lecterns. One example of that presentation software category is iPresent from Zapptek, which works with any video-capable iPod that has a color screen. iPresent lets users convert PowerPoint, PDF, or Keynote presentations into slideshows and syncs those to the mobile device. Da-Lite's universal dock accessory comes with a remote control; a cable for composite audio video output; USB; a wall outlet adaptor for the USB; and adapter plates to ensure compatibility with different iPod and iPhone models.